Newly arrived migrants gather at Kuala Langsa Port in Langsa, Aceh province, Indonesia last year. Pic: AP. THIS week marks the one year anniversary of the disastrous Andaman Sea migrant boat crisis. However, one year on, it appears not much has changed in terms of resolution. Following the events that took place last year, national and international human rights organizations have consistently documented a lack of protection regarding Rohingya refugees. They unanimously urge for the discontinuation of arbitrary and indefinite detention of refugees and survivors of human trafficking — stating such consequences as a detriment and ultimately exasperating the already difficult situation. More so, they have pushed for an abolishment of the “push back” policy that exposes trafficking survivors and migrants to even greater dangers. Rights groups have tenaciously voiced that protection is still lacking and even more so that basic human rights are continuing to be disregarded. Saving face is integral to Thailand’s intricate culture. Though owning up to these reoccurring abuses will ultimately have an even greater impact on the country’s international reputation. On May 1, 2015 Thai officials initiated a public acknowledgement of the existence of mass graves containing more than 36 Rohingya and Bangladeshi bodies. Soon after, it become clear that these were victims of human trafficking which immediately sparked outrage. In the following days more bodies were discovered, consequently causing traffickers to clear out and abandon their camps. Not only were Thai officials found to be involved in trafficking networks, Thailand began a bitter clamp down on its borders, refusing Rohingya and Bangladeshi migrants and trafficking victims access or assistance. This directly triggered thousands to become stranded at sea causing an unknown loss of life. Human rights groups are highlighting that the protection of these individuals are of the utmost importance and should never be overlooked, urging Thailand to react appropriately. 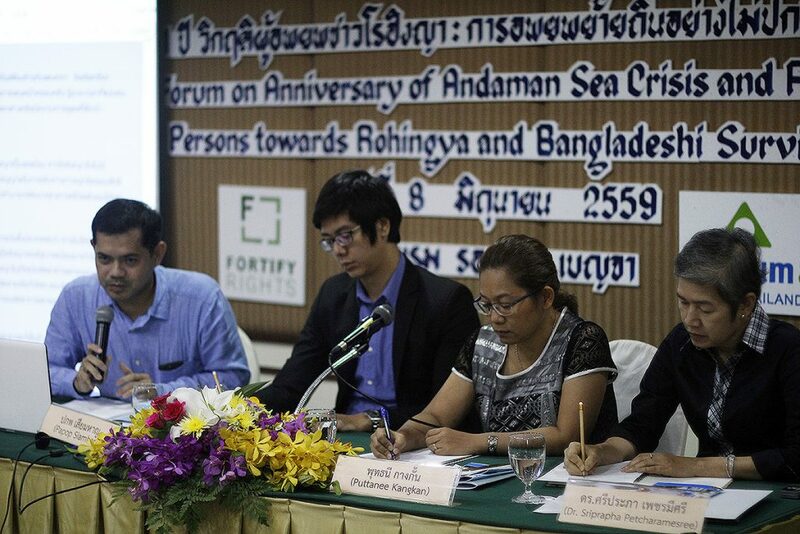 The National Human Rights Commission of Thailand (NHRCT) hosted a forum in Bangkok Wednesday discussing the condition of Rohingya refugees and human trafficking survivors in Thailand one year after the boat crisis. 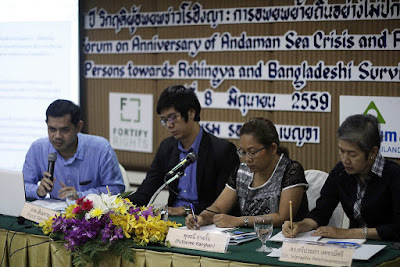 Six other groups also contributed to the forum: the Coalition for the Rights of Refugees and Stateless Persons (CRSP), the Human Rights and Peace Studies Center at Mahidol University, the Migrant Working Group (MWG), Asylum Access Thailand (AAT), Fortify Rights, and the Human Rights and Development Foundation. Over 170,000 Rohingya seek refuge from systematic abuses today due to religious persecution and violence in Burma (Myanmar). Migrants are commonly captured by transnational criminal syndicates where they have been documented sustaining abuse such as imprisonment and torture while being trafficked through hidden camps scattered in Thailand. Rescued survivors however are still victims of abuse while they are detained in IDC’s (Immigration Detention Centers). All six organizations have voiced their concern with the length that such migrants stay in these IDCs, illuminating the tragic possibility of indefinite detainment. The National Human Rights Commission of Thailand (NHRCT) hosted a forum in Bangkok, Wednesday. Pic: Caleb Quinley. The panelists discussed their support for a Cabinet Resolution that passed on March 15. If implemented, the resolution would allow witness protection to all witnesses in human trafficking trials and even legal status for those who have survived human trafficking in the country. Regardless of the support, the Resolution has not been seriously implemented. In the past six months, 60 Rohingya refugees have reportedly escaped from IDCs in the south of Thailand. After receiving alerts from locals on the escapee’s whereabouts, Thai police made an attempt to re-arrest the Rohingya individuals. Police then fatally shot one of the men, failing the Rohingya once again. This most recent occurrence has led these organizations to take swift action calling on the Thai government to examine the incident. The organizations insisted that Thailand should protect human trafficking survivors, stop push back policies, grant protection for trafficking related witnesses, push for the Cabinet Resolution and end indefinite detention. Caleb Quinley is a writer and photographer based in Bangkok, Thailand. His focus topics are politics, conflict, urban poverty, and human rights issues.